With most brands of utv's-straightt off the showroom floor-accesss to the UTV bed is challenging to say the least. The hitch-step attaches to the UTV hitch receiver and provides "walk-in" access-in spite of the awkward height of UTV beds. The all-aircraft-aluminum hitch-step includes a 14" wide x 16" long folding platform that features slip-resistant gripping ridges and cable suspension that provides a 300 lb. Weight limit. 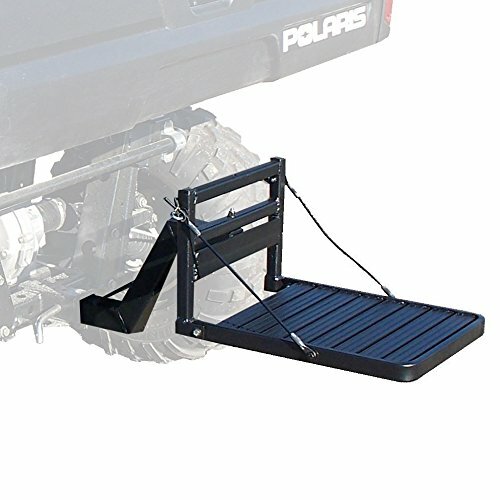 The hitch-step is positioned out of the way, but at the perfect point for safe step up into UTV bed. It even folds up under the UTV bed during travel.